It’s showtime race fans. Thanks to racedayct we’ll be able to follow the action as it happens. No TV, no live timing, not even an entry list as far as I can see. No web site? How can that be? And speaking of showtime, Jimmy Blewett will be at Bronson as well as at New Smyrna for 5 races assuming of course there are no unforeseen problems. It’s all an experiment as he replaces Ronnie Williams in the 21 for a limited engagement that may or may not lead to something more. Is Joe Bertuccio wondering? His car at times shows flashes of top tier speed. So does he have a consistency problem or a Ronnie Williams problem. Pure speculation. 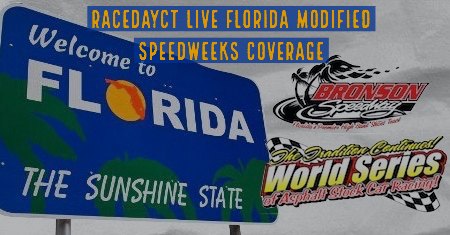 A few tour modifieds kicked off the dust on Thursday for the open practice on the shoreline track and as expected times were all over the place. Ya gotta love Preece who was there. With all he’s got going with his new Cup ride and sponsorship commitments he’s out there for every sessions doing the tedious work of making the 6 better even though he can only be there for the first three nights. Eric Berndts mentor to resurgence in the Stafford SK’s Stash Butova guided Blewett to the fastest lap speed of the day of 17.25. Coby and Preece in the 17.40 range. All consistent for the most part with last years early practice numbers that generally bear no resemblance to race lap times in features that are predictably slower. Who knows what the field will look like at Bronson. We do know that at the World Series it will once again be very strong AND on TV.